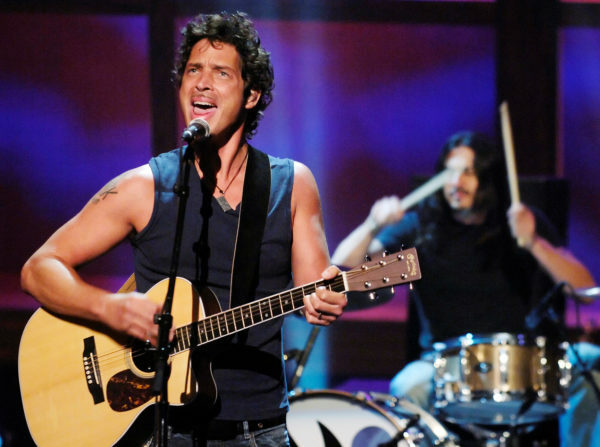 Chris Cornell (L) and Brad Wilk of music group Audioslave perform live during the "ReAct Now: Music & Relief" special at Paramount Studios in Los Angeles, Sept. 10, 2005. Chris Cornell, a key figure in the 1990s grunge rock movement as the founder and frontman of Soundgarden and later Audioslave, died Wednesday night in Detroit sometime after playing a show at the Fox Theatre. He was 52. Brian Bumbery, a representative for Cornell, confirmed the rocker’s death to the Associated Press, calling it “sudden and unexpected.” He was in the middle of a national tour with Soundgarden that, on Friday, was scheduled to play in Columbus, Ohio. Details are scant at this time. Alongside bands such as Nirvana and Alice in Chains, Soundgarden was one of the seminal bands of the grunge rock movement that began in Seattle and ushered in a new era of rock music. Soundgarden, which Cornell founded in 1984, was particularly important to this movement for being one of the first grunge rock bands to sign with a major label. His soaring guitar solos and throaty voice, which he once called “unapologetically male,” resonated with music listeners at a time when New Wave and hair metal competed for chart space. Soundgarden’s songs, like most grunge bangers and ballads, meanwhile, sounded like the classic rock music produced by bands such as the Who, Alice Cooper and Led Zeppelin. They were laden with emotion — and more often than not, that emotion was anger. “For me to make a connection with music it has to either have a visceral nature, whether it’s anger or aggression or that kind of passion which shows up in rock music, or there has to be some sort of melancholy and introspection, something about it that makes you feel your own pain,” Cornell told Rolling Stone. Grunge became increasingly mainstream, and with it, Soundgarden’s reach grew. Its 1994 record “Superunknown” topped the Billboard 200 charts, and its 1996 follow-up “Down on the Upside” peaked at No. 2. The band went on hiatus in 1997, though most rock fans assumed the group had broken up. “Every time I did an interview, I was asked, ‘Is Soundgarden ever going to get back together? Will the band ever do anything again?’” Cornell told Gibson.com in 2011. Indeed, it would. The band returned at the end of 2012 with the well-received “King Animal.” Its fans were still around and hungry for new music, it seemed, as the album peaked at No. 5 on the Hot 200. With Soundgarden was on its hiatus, Cornell founded the so-called supergroup Audioslave with Tom Morello, Tim Commerford and Brad Wilk, three members of Rage Against the Machine. That band eventually broke up but reunited in January 2017 to play a concert at the Teragram Ballroom in Los Angeles in protest of President Donald Trump. Cornell’s beginnings were a little more humble than his success might suggest. And musician he was, but he found himself playing in a cover band called the Shemps when he was 18. He wanted to write and perform his own music, as he recalled to Richmond’s Style Weekly. The fame his music brought him came with a steep price. He spent time in rehab for “various things,” but “mainly for drinking,” he told Spin. According to Cornell, it was a way of escaping his fame, which he found isolating. “I’m Irish: If I could get the cap off something, I would drink it. And drinking was really an extension of becoming isolated from all my other relationships,” he told the magazine, remembering the first time he was recognized “at four in the morning, in the middle of Mississippi” after the music video for his song “Outshined” played on MTV for the first time. After that, he tried avoiding the public. Drinking made that easy. “I could drink a lot, and I tended to have violent outbursts,” he added. In 2002, he “had to come to the conclusion, the sort of humbling conclusion that, guess what, I’m no different than anybody else, I’ve got to sort of ask for help — not something I ever did, ever, as he told Blabbermouth, so he checked himself into rehab.